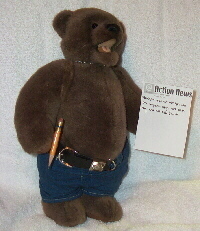 Best wishes and hopes to everyone for 2007 (or Star Date 60467.7,) from @Action News. Live long and prosper! After the damage to equipment and facilities and the loss of personel to the SED (Society of Evil Doers) by the attack of the "Tauren Empire", the society found itself at a low point. The subsequent destruction of the SED headquarters left its members disbanded and in many cases homeless as some members lived on the now destroyed SED campus. Although Christmas has passed, hopefully the spirit of the holiday is still among us. 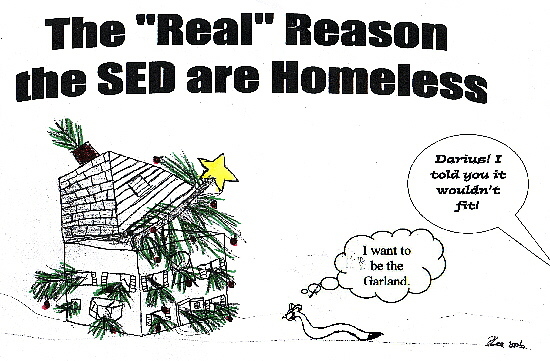 This has been shown by Abbie, local fae, who has taken in several SED members who are homeless. Portia Lee, local red panda has been actively searching for a new dwelling and it is assumed that other former SED members are doing the same. Although the SED as an organization caused a number of disruptions to the life of residents of SpinDizzy, as individuals they seemed pleasant and friendly enough. With that in mind residents have been doing what they can to assist the homeless ex-SED members. It is hoped this helpul attitude will continue among residents and the homeless population will find shelter. Morticon, local wallaby and alleged leader of the SED had little to say except that he is considering a home he has found but it may be haunted. He did say, "While I may have lost it all and have to start from scratch, I will rebuild. Maybe not the SED, though. For I lost the base and everthing in it." Only time will tell what will come of Morticon and the remains of the SED. Spindizzy has a new queen of the cutes it seems. 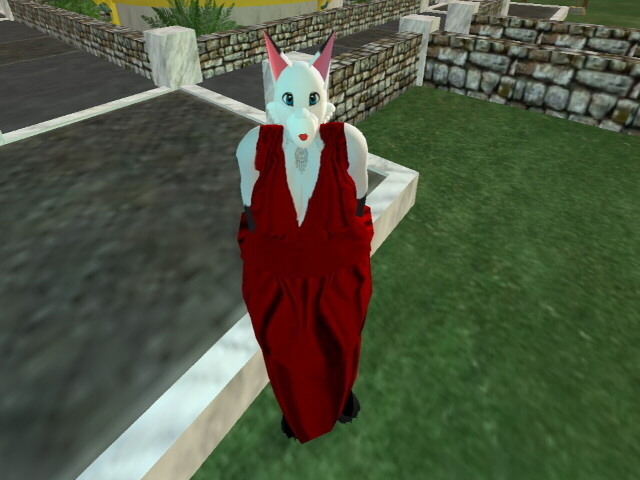 Barbara Belle (call her BB) Zuhal, noted arctic vixen, has come to town to challenge the dominance of Vixie, local fox as leader of the cute food chain. "Vixie has ruled for far too long, " she is quoted as saying. "It's time for a new direction and I'm surely the direction to take." Miss Zuhal was very confident that she was the one to take over the position saying that. "I've got talent, looks, beauty and I'm more humble than Vixie could ever hope to be. What more can you ask for?" Reactions of this claim were mixed. "She's certianly very cute and does comport herself with poise." said Ba'ar, local bear, singing the praises of the newcomer. Others weren't so sure. ""Look dear, fair's fair. We don't need a cute war around here." Cora, local-she bear is quoted as saying. "I'm cute, if I do say so myself, but I don't feel the need to challenge Vixie when she's already proven herself time and again that she's the cutest." Vixie, local vixen, was unable to be reached for comment. Have you ever wanted to see what the REAL Rose Garden looked like? Well, now is your chance. If you are coming to Further Confusion, it might be arranged for there to be a Spindizzy outing to the real Rose Garden. Please take a look at the voting booth (VOTE when connected to SpinDizzy,) and answer the two questions in regards to a Rose Garden visit. This is not a for sure thing, but if enough are interested and a time is set, it should be fun. Upon (a sensible) request, I added your @image setting to the list of props the morph program saves for each morph. @image is an easy way to link a URL (typically a picture) to a character, zombie, room, etc. Try it and see! In any case, from now on, new morphs saved (or re-saved) will retain their @image value as well. This allows for each morph to have a unique picture associated with it. Have fun! Join us as the 2006 tree is retired. How will it be retired this year? You'll just have to come and find out! Just an OOC note, I would like to say that, over the past month, SpinDizzy has been of particular comfort to me; iRL, my mother passed away on December 15, after several weeks of illness. Her passing has left a great sense of loss and emptiness in my heart iRL. However, being able to escape to SpinDizzy, for even a little while, has enabled me to bear the pain when I turn back to the world in which I must face reality, even with the support of family and friends. Particular thanks to Chanspot, whose Casino opening came the night before mom passed away. Playing Boggle was something mom and I used to share, and, it was a nice reminder of those better times to play it, again, at Cash Creek. Thanks, also, to Morticon, for giving me something positive to focus on, even unintentionally, when his RP meeting put wood on a fire which had been smoldering too low under my spotty backside for a long time. Now, with the aid of cruise line brochures which mom had saved, I will launch SpinDizzy's first (to my knowledge) luxury liner, which I hope will provide much enjoyment to those who walk her decks. I laid down the keel of the S.S. Lady Angharad on December 23, and am working on constructing a seaworthy vessel, luxuriously appointed, which will appeal to the adventurous of spirit. I anticipate launching her maiden voyage sometime in early 2007. Be well, and may your new your be happy and prosperous. Pathfinder waves as he pops in. "Hi." Pathfinder form glows with random colors as he returns to his normal size. Aleph says, "Welcome, please have a seat." Pathfinder stretches a bit, drops into a empty seat. "Thanks. How you doing today?" Aleph says, "Thanks for joining us Pathfinder. Is that what you prefer to be called?" Pathfinder nods "Yes. There a Logan running around so to avoid confusion. Call me by my last name of Pathfinder. Aleph says, "Alrighty then. So, for our readers who might not be familiar with you yet, can you tell us a little bit about yourself?" Pathfinder smiles "Ok. I try not to bore you to death. Am a dimension traveler, bit of a time traveler as well. I been spending a good part of my life just wandering around seeing and doing things. Spindizzy is just one more stop in a unending sight seeing trip. Aleph says, "Would it be fair to call you an 'Adventurer'?" Pathfinder nods "It be fair to. I gotten into enought trouble to have that as a title. I like to see myself as a hero, not that everybody agrees with me." Aleph says, "Many adventurers seem to have quite a few brushes with peril on their adventures. In your opinion, is a sense of danger an important part of the adventuring experience?" Pathfinder shakes his head in a no. "I have as just as much fun helping people or learning new things. Danger is something you shouldn't be looking for, more then anything it going to find you without wanting it. Aleph nods. "Now, you say that you see yourself as a hero. Are there any specific qualities that you feel it is vital for a hero to possess?" Pathfinder says, "You have to want to help others, that's important or you never would care in the first place. Second you have to have some common sense about what you're doing. I dimension travel so I see alot of things I don't care for but I can't go changing every dimension I run across into a mirror of my ideas. Last of all I just belive in goodness, I don't understand why anybody would want to hurt others or inflict pain on them. I been hurt before and the last thing I want to do is spread that pain around." Aleph says, "Do you feel that anyone has the potential to be a hero, or would you say some people are better suited for it than others?" Pathfinder says, "You have to define the word Hero. To some the simple act of kindness when you didn't have to do it make you a hero. To others you're not a hero unless you did something that has a inpact on your world or the people around you. And anybody can be a hero, one day you might be given the chance to save a life or make a difference. If you do that then you're a hero to someone. And yes, not all heroes are created equal. Some people have been blessed with a greater share of something, that's just how life is. But there is something everybody should remember. Everybody is special in some way, the problem is most people never find out what's special about them." Pathfinder says, "They really need to pass out instruction books to people when they're born, it'd make life a whole lot easier for everybody." Aleph says, "Now, you've talked about traveling through different dimensions and times. Can you tell our readers about some of the things you've witnessed in your travels?" Pathfinder says, "Well I've been to a lot of places, one thing I have noticed is just about anything you read or see in one dimension is real somewhere out there. And somewhere out in the mulitverse there's something about you somewhere. In a book, in a comic, maybe in a TV. I've met at leave one version of Superman in my travels. I had a great deal of fun and been scared at times as well." Aleph says, "You met Superman? Was he nice?" Pathfinder chuckles "He was a bit ticked off when I met him. I lost my memory once, ended up living on a world and becoming a superhero. The group I was in once got into a fight with the Justice League, big misunderstanding but things got fixed up. He a nice dude all in all. Aleph says, "Do you still have any superpowers?" Pathfinder nods "Yes. All the things I learn and what I can do would be seen as superpowers. I dimension travel by will alone, no blue box or time tunnel. Just me. 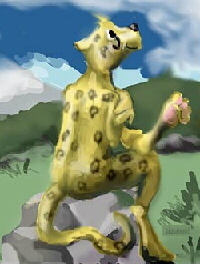 Aleph says, "So, after all of your adventures, you now find yourself here on SpinDizzy. What do you think of it here?" Pathfinder says, "I like this place. It peaceful and the people are nice. I've been coming back here to rest up between dimension hops." Aleph says, "Can you tell us about some of the activities you're enjoying in your down time here?" Pathfinder says, "I enjoy listening to music, playing games. Portia's been teaching me card games to play. I like dealing with people, making friends. I am open to new ideas, if I don't like something I just tell you I don't and leave it at that." Aleph says, "You recently tried out one of your potions on local coati Austin. Can you tell us how that turned out?" Pathfinder laughs "The potion work on him but he didn't have a clear size set in mind before he drank it so he ended up reponsing to the first size someone else spoke to him about. He ended up large because I ask him if he was planning on being a mecha size coati. Also because of his powers to stretch he kind of enlarge one body parts at a time. Aleph nods. "Are there any other scientific pursuits that you enjoy?" Pathfinder says, "I like learning in general, Aleph. Am too curious for my own good and tend to poke around into stuff if I think it ok to do so. I make potions, magical items and mad scienist gear. I can combine different forms of power to make items. Like techno-magic devices." Aleph says, "So do have any plans? What's next for Logan Pathfinder?" Pathfinder smiles "Well I need to build myself a house, for all the time I spent here I haven't yet. I need to fix up the StarHopper, my mecha I brought here and I'd very much like to talk some sense into Mortican's silly little head. Beyond that am just looking to make some friends, maybe even find some people willing to travel with me for a bit." Aleph nods. "Talk some sense into Morticon?" Pathfinder nods "Yes. The whole SED, the evil folks out to take over. Really don't see Morticon as evil, just misguilded. If he is evil then he's hiding it well in my book. Aleph says, "Well, I'm afraid we're about out of time. Do you have any parting thoughts that you'd care to share with our readers?" Pathfinder says, "Any female out there looking for a boyfriend? Also in the end you have to figure out if what you do is truely you or what someone else wishes of you. Be yourself and be happy." Pathfinder says, "Thanks for having me here Aleph." Aleph nods. "Thanks a lot for taking the time to sit down with me today. This has been Aleph with Logan Pathfinder, on Ultimate Interview Feature 9000, reminding readers that I'm still working on the title. Thanks for reading, and we'll see you next time." Here's your final Spindizzy @Action News survey for the year: "What do you think was the biggest Spindizzy news story of 2006?" Ba'ar growls, "My personal choice would be the disbandment of the SED by Morticon." Argon says, "This is a tough one. As far as @Action News, I'd have to say moving the paper to Findra's server. Its reliability has beat the old one (Earthlink) 10 to 1. 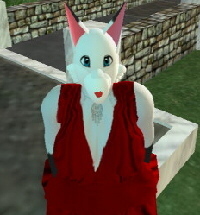 Also being able to personally contact the server admin, Findra, has been of great help. As far as SpinDizzy as a whole, I'd have to say the "landing" and servicing of SpinDizzy was one of the biggest events." BB_Zuhal growls, "The biggest event was, of course, the day when I came to town." Ray says, "In my opinion, the biggest Spindizzy news story of 2006 was the failed invasion of SpinDizzy by the Tauren Empire, especially considering what it cost the SED in terms of lost manpower and resources from its part in the defense of SD. The SED never really had a chance to recover, which led to the destruction of the HQ of that weakened organization, and the current displaced status of the SED leadership. Where this will lead will probably have repercussions well into the new year." Tzolkin thinks.. "When Portia was found to be a vampire, and eventually cured. That had to have been one of the best RPs all year that I know of." Austin says, "Oh, well, that's obvious, Ba'ar. It'd be when Beltrami, Felix, and Lou made contact with the 'Firebird' entity Kern and Ing always go on about and were reformed as the life-force guiding the destiny of Spindizzy." Than giggles "The one 'bout me climbin' the 2005 tree before they took it down, 'cause it the first time I ever inna paper!" Gilead chirps, "Actually, maybe the casino opening was the biggest story." Chanspot votes for Casino! But is biased, yeah? But Peppermint is also very cool. Hrmhrm! Aushae sultrily sibilates, "But... if I had to choose one, I would say perhaps Austin's bigification that doesn't seem to end soon, might be it..
Andros says, "The botched Tauren invasion." Tanuki barks, "The ninjas quitting?"